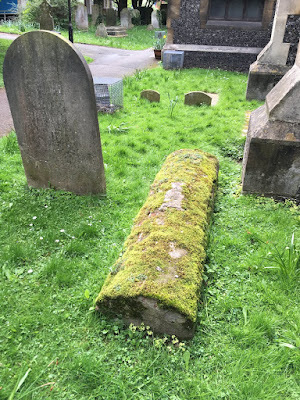 You can find this tomb immediately to the south of St Nicholas Church. It is a long simple arched brick tomb (shaped like a body stone) oriented on a west/east axis. There are lots of tombs like this all over the country made of stone. Brick arched tombs emerged as a more frequently encountered type in the late 18th century. They often have head and foot stones but the one in St Nicholas Churchyard doesn't have these. This tomb is thought to date from the early 19th century. On the top, a stone plaque bears the initials 'R.F.' or 'R.T'. The brickwork is decayed, and a concrete coating has been applied sometime in the past and it is now very worn. It would be wonderful if we could find out more about this person. This should be possible as the burial records are all online now. We should at least be able to narrow down the list of possible candidates. As it stands nothing is known of the person commemorated here, other than their initials.